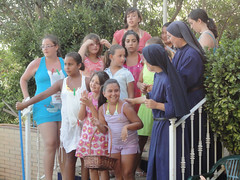 At the end of July, here in Alcala de Guadaira (Seville) we had special “Summer Activities Days” for the girls. They were three exciting days (July 29th-31st) in which 30 girls came to the Home of the Mother to share in the experience of friendship, growing closer to Our Lady, reflection, games, songs, plays, cooking, water, water, and more water...crafts, Confession, and more. Nearly 60 girls from the ages of 8 to 22 attended the Home of the Mother summer camp in Leon, Spain, from July 3rd to July 13th, 2010. The camp started for the majority of the girls in Cuenca, where they began an 8 hour bus ride to Leon filled with songs and games. Once they arrived, the camp activities began. On July 17th, we celebrated a Mass of Thanksgiving for the approval of the International Public Association of Faith, the "Home of the Mother". His Excellency Bishop José María Yanguas, bishop of Cuenca, presided over the Mass, which took place in the Parish of St. Nicholas of Bari, Priego, province of Cuenca, Spain. 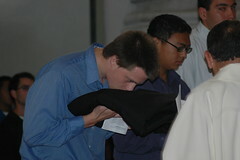 From July 3rd to 17th, a pilgrimage for boys to Santiago de Compostela, Spain, took place. The pilgrimage began with a trip to Fatima on July 3rd, where we spent a few days honoring our Blessed Mother, in the places where she appeared to the three young children. On July 2nd, in the Parish Church of St. Nicholas of Bari, Priego, Spain, we had several celebrations of vows of the Servant Brothers and Servant Sisters. On July 16th, Feast of Our Lady of Mt. Carmel, a large group of Brothers and Sisters entered the notiviate.